The City of Vancouver is close to finalizing a deal to construct a new City Hall as the first phase of the massive Waterfront Station Transportation Hub. 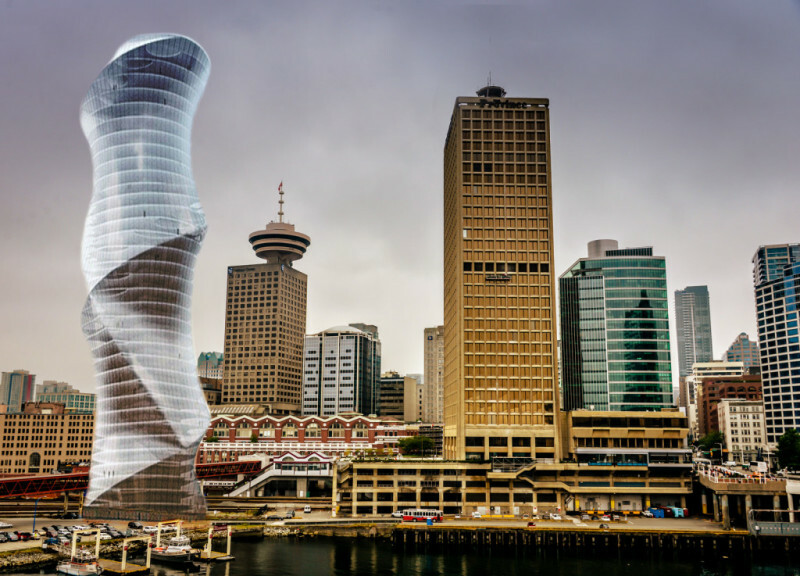 Early concepts depict the new City Hall located inside a 43-storey, 192-metre tall office building that is cylindrically shaped and uses a mix of helical shaping to become a sculpture as it ascends into the sky. It can accommodate up to 6,000 office workers and will be the new place of employment for most of the municipal government’s desk staff. The project takes a page from New York City’s Hudson Yards Development project and the failed Whitecaps FC Waterfront Stadium proposal in which a large platform will be built over the Central Waterfront railyards located next to Waterfront Station and the SeaBus terminal. The iconic tower and a large outdoor public plaza that can hold crowds of up to 10,000 people will be constructed on top of the platform. The tower itself will be among Vancouver’s largest in terms of floor area with 807,293 square feet in space. The new Council Chambers will be highly accessible to the public on the lobby level of the building while the offices of the City’s elected officials will occupy the 18th floor. Any unused and completely vacant floors will be leased to prospective office leaseholders. The tower will be the tallest within the Waterfront Station Transportation Hub master plan to revitalize the station and become one of the continent’s greatest models of transit-oriented development. The plan calls for street extensions, a glass roof expansion of Waterfront Station, a bus exchange, new subterranean connections to the new and expanded SeaBus terminals, public spaces and at least four office towers. Following the City of Vancouver’s ambition to become the greenest city in the world by 2020, the new City Hall building will also be known for its green and energy conservation designs. This includes seawater heating and cooling, on-site water treatment, triple window glazing and solar shades. Given the adjacent proximity of Waterfront Station, the City will also be encouraging its staff to commute to work by public transit. The cost of the project is estimated at $600-million and will largely come from the City of Vancouver’s Property Endowment Fund, which has a mandate to accomplish the city’s goal of developing a model of sustainability. It will also be a boon to local businesses in the area, particularly restaurants and service-based businesses in Gastown, and could become a catalyst for other major economic opportunities in downtown Vancouver. Meanwhile, the existing City Hall site and buildings will be retained under city ownership and renovated with an aim of turning the site into a major tech hub. Additional office buildings could also be built on the site, where the East Building is located. A formal announcement is expected soon to reveal the full scale and implementation plans.